The first part of this introduction to ergodic theory addresses measure-preserving transformations of probability spaces and covers such topics as recurrence properties and the Birkhoff ergodic theorem. The second part focuses on the ergodic theory of continuous transformations of compact metrizable spaces. 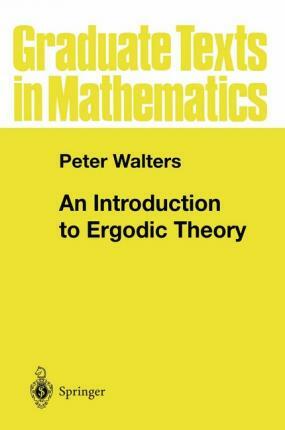 Several examples are detailed, and the final chapter outlines results and applications of ergodic theory to other branches of mathematics. Illustrations note IX, 250 p.
0 Preliminaries.- 0.1 Introduction.- 0.2 Measure Spaces.- 0.3 Integration.- 0.4 Absolutely Continuous Measures and Conditional Expectations.- 0.5 Function Spaces.- 0.6 Haar Measure.- 0.7 Character Theory.- 0.8 Endomorphisms of Tori.- 0.9 Perron-Frobenius Theory.- 0.10 Topology.- 1 Measure-Preserving Transformations.- 1.1 Definition and Examples.- 1.2 Problems in Ergodic Theory.- 1.3 Associated Isometries.- 1.4 Recurrence.- 1.5 Ergodicity.- 1.6 The Ergodic Theorem.- 1.7 Mixing.- 2 Isomorphism, Conjugacy, and Spectral Isomorphism.- 2.1 Point Maps and Set Maps.- 2.2 Isomorphism of Measure-Preserving Transformations.- 2.3 Conjugacy of Measure-Preserving Transformations.- 2.4 The Isomorphism Problem.- 2.5 Spectral Isomorphism.- 2.6 Spectral Invariants.- 3 Measure-Preserving Transformations with Discrete Spectrum.- 3.1 Eigenvalues and Eigenfunctions.- 3.2 Discrete Spectrum.- 3.3 Group Rotations.- 4 Entropy.- 4.1 Partitions and Subalgebras.- 4.2 Entropy of a Partition.- 4.3 Conditional Entropy.- 4.4 Entropy of a Measure-Preserving Transformation.- 4.5 Properties of h (T, A) and h (T).- 4.6 Some Methods for Calculating h (T).- 4.7 Examples.- 4.8 How Good an Invariant is Entropy?.- 4.9 Bernoulli Automorphisms and Kolmogorov Automorphisms.- 4.10 The Pinsker ?-Algebra of a Measure-Preserving Transformation.- 4.11 Sequence Entropy.- 4.12 Non-invertible Transformations.- 4.13 Comments.- 5 Topological Dynamics.- 5.1 Examples.- 5.2 Minimality.- 5.3 The Non-wandering Set.- 5.4 Topological Transitivity.- 5.5 Topological Conjugacy and Discrete Spectrum.- 5.6 Expansive Homeomorphisms.- 6 Invariant Measures for Continuous Transformations.- 6.1 Measures on Metric Spaces.- 6.2 Invariant Measures for Continuous Transformations.- 6.3 Interpretation of Ergodicity and Mixing.- 6.4 Relation of Invariant Measures to Non-wandering Sets, Periodic Points and Topological Transitivity.- 6.5 Unique Ergodicity.- 6.6 Examples.- 7 Topological Entropy.- 7.1 Definition Using Open Covers.- 7.2 Bowen's Definition.- 7.3 Calculation of Topological Entropy.- 8 Relationship Between Topological Entropy and Measure-Theoretic Entropy.- 8.1 The Entropy Map.- 8.2 The Variational Principle.- 8.3 Measures with Maximal Entropy.- 8.4 Entropy of Affine Transformations.- 8.5 The Distribution of Periodic Points.- 8.6 Definition of Measure-Theoretic Entropy Using the Metrics dn.- 9 Topological Pressure and Its Relationship with Invariant Measures.- 9.1 Topological Pressure.- 9.2 Properties of Pressure.- 9.3 The Variational Principle.- 9.4 Pressure Determines M(X, T).- 9.5 Equilibrium States.- 10 Applications and Other Topics.- 10.1 The Qualitative Behaviour of Diffeomorphisms.- 10.2 The Subadditive Ergodic Theorem and the Multiplicative Ergodic Theorem.- 10.3 Quasi-invariant Measures.- 10.4 Other Types of Isomorphism.- 10.5 Transformations of Intervals.- 10.6 Further Reading.- References.